Vinyl flooring, also called lino by some, is popular for use in rooms that need a waterproof flooring. We wouldn’t recommend laying carpet in a bathroom or kitchen. It will get wet and start to smell. This is where vinyl comes into play. Vinyl flooring allows you the ability to be able to have a water fight in a room and know that it can all be cleaned up with a simple mop and bucket. Much easier to clean than most other floor coverings, vinyl flooring is by far and away the most popular choice for bathrooms and kitchens. The reason it’s the most popular, is because it’s the most sensible! When it comes to designs, you can’t go wrong with vinyl flooring. There are thousands of different designs, each of which is available in a variety of colours. There is wood effect vinyl flooring, tile effect vinyl, marble styled vinyl and many more. We have a huge variety of vinyl flooring sample books that contain different designs so you can see the pattern, the colour and feel the texture of the vinyl too. Our showroom has a massive selection of vinyl for you to choose from, you’re sure to find what it is that you’re looking for. Huge selection of competitively priced vinyl in stock. If you’re looking to be able to come in, take a look around, find your perfect vinyl and then be able to take it away. Then that’s not a problem. 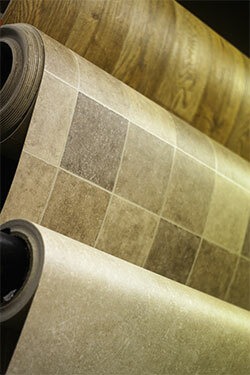 We have a large selection of vinyl flooring in Plymouth. We have vinyl on the roll that can be cut to size and taken away. What we don’t have on the roll, we have as a remnant. In our Plymouth based showroom, not only do we have hundreds of carpet remnants, we also have plenty of vinyl remnants that can be taken on the same day. Our friendly staff will happily load your vinyl into your vehicle for you. So, why not come and view our vinyl flooring in Plymouth? Dedicated and experienced fitters available upon request. Fitting vinyl flooring in Plymouth can be a mammoth task. It’s not something that many people like to be burdened with. However, we have experienced fitters that would happily take on the challenge for you. From intricate little toilet rooms to large kitchens. Our fitters are dedicated to providing their best work when it comes to fitting your vinyl flooring in Plymouth.